Few things woo me back into the kitchen like candy making. Not only is it fun and delicious, when making candy I always have this devious, subversive feeling come over me. As though I've thwarted some natural law by bringing the special, highly rationed substance CANDY into existence with my own humble hands. This probably stems from my childhood, which was one of gross candy deprivation. Well not really, but when you're a pint-sized sugar addict, even reasonable dietary restrictions tend feel like anything but. 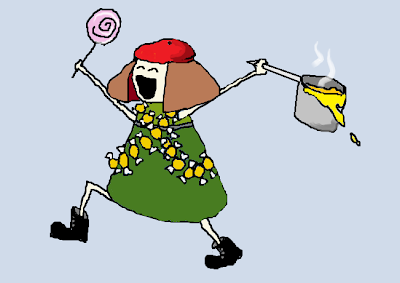 So when little Ms. Humble discovered it was possible to MAKE candy at home and it required neither money or parental permission, I felt liberated. A weekend of chores for a mere candy bar? As if! Restrictions because I just happened to leave a half gnawed Sugardaddy from Halloween in the couch cushions? Haha! I knew I could make my OWN candy. Tons of it! Never mind that I lacked a heavy bottomed pan, a thermometer or any fear of molten sugar. I was free. I was a sugar rebel. The feeling persists nearly two decades later, so when I see caramel smothered marshmallows at $16 a pound, the inner sugar rebel stirs. I can make my own! Alright fellow rebels, let's rock and roll. Note: These candies require some patience, so be prepared to clear an afternoon to make and individually wrap them . You may be tempted to speed up the process by making the caramel and marshmallow simultaneously, and of course you can do that. However, minding the multiple pots of bubbling sugar, rapidly rising temperatures, a double boiler and a whirling mixer will require excellent multitasking skills. *In almost all my baking, I use 40% minimum milk-fat cream. This cream can be found in the large warehouse stores like Costco, restaurant supply and some gourmet food stores. If you're not able to find this ultra rich cream, you can substitute regular heavy cream, just look for the highest percentage of fat you can get your hands on (30-40% is sufficient). **Or liquid glucose. You may also use invert syrup. This recipe is a modified version of my fleur de sel caramels with a few adjustments (I've omitted the vanilla and added some salt to highlight the butterscotch notes of the caramel). See the comments from that page for helpful hints regarding this recipe and candy making in general (particularly the bit on thermometer calibration). Lightly butter a 18" X 13" sheet pan, or a large marble pastry stone. In a large heavy sauce pan (the caramel will more than triple in volume, so you need plenty of space) over medium heat combine sugar, corn syrup, salt and one cup of the heavy cream. Stirring constantly with a silicon spatula or wooden spoon, bring the mixture to a boil. This will take some time. Don't be tempted to turn up the heat, candy requires patience. Add butter one tablespoon at a time, stirring after each melts. Clip on your candy thermometer and allow to boil over medium-low heat until the mixture just hits 250°F (Firm Ball stage) stirring occasionally. This should take about 30-40 minutes; if your temperature is climbing too quickly you might need to reduce heat all the way to low. By the same token, if you're not hitting 250°F by 40 minutes you might want to increase the heat a bit. Once you've hit the right temperature, quickly remove from heat and pour into your prepared pan or onto the greased stone slab, spreading it out in an even layer. To prevent any crystallization, don't scrape the pan as you pour, just allow what clings to the pan to remain in it (you can scrape it into a smaller dish and eat it later, odds are it won't be crystallized). Allow your molten caramel to cool to room temperature. While the caramel is cooling, go ahead and start on the marshmallows. I'm using the blog's peppermint marshmallow recipe as the filling for these candies since they are particularly soft and luscious. Of course, I am substituting a teaspoon of vanilla for the mint oil. You can also use your favorite vanilla marshmallow recipes for this, provided it produces enough marshmallow to fill either a 13x9" or a 9x9" pan roughly 1" deep. Follow the recipe posted here, omitting the mint oil and adding a teaspoon of vanilla to your stand mixer after adding the hot syrup. Spread the marshmallow batter into a lightly greased 13" x 9" casserole. Allow the marshmallows to cure for about an hour before running a knife around the pan and releasing the sheet of marshmallows. Cut the sheet into roughly 1" strips. If handling the sticky marshmallow irks you, simply dust it lightly in a mixture of half powdered sugar, half rice flour to remove stickiness. By now your caramel should be completely cool. Cover a large surface or cutting board with a few pieces of waxed or parchment paper and, depending on how wide your marshmallow strips are, cut the caramel into sheets of similar width. If the caramel seems a little too thick for your tastes, you can flatten the sheet with a rolling pin before cutting. Roll the caramel firmly over the marshmallow. Once it is encased, cut away the excess. Pinch the edges together and then wrap the caramel marshmallow log in waxed paper and place in the refrigerator to chill. Repeat until you've used the entire sheet of caramel. Once you've used up all your caramel give the candy "logs" about 10 minutes in the refrigerator to chill until firm. You may have some marshmallow strips left over depending on how thin your caramel sheet was. Cut remaining marshmallow into cubes dust in powdered sugar and rice flour and treat yourself (or the person washing your dishes) to a mug of hot cocoa. Then break out your sharpest knife and begin cutting the log into equal pieces. Be sure to eat the end scraps immediately, this is an important quality control step. Arrange single layers of caramel covered marshmallows between sheets of waxed paper and chill before wrapping (this makes them firmer and easier to wrap and handle, but be sure to eat them only at room temperature). Wrap individual caramels in waxed paper, parchment or cellophane to prevent sticking. The caramel may appear firm and solid but it is still a fluid. It will eventually conform to whatever shape your wrap it in, so if you want it to maintain the cube shape, wrap it carefully as a cube and pack them tightly side by side. If you don't, no worries. Sure, there is a chance they'll end up looking like these but hey, If See's makes them like that, there is absolutely no shame in a lumpy caramel wrapped marshmallow. The caramels are best eaten within a week, but will keep for up to two weeks well wrapped and sealed in a air tight container stored in a cool spot. Now I'm off to pack up half of these to send to Mr. Humble's lab because they're just too dangerous to have around here. I thought I was done with my holiday baking, but I think you just wooed me back into the kitchen! These remind me of an uber-Cow Tail. I hated those candies, because they tasted so fake. These look phenomenal. How you mustered up the patience to make them look so beautiful, I'll never know. I've made caramels and marshmallows before, but never combined them - I know what's next on my list! These candies remind me of scotch kisses from See's Candy. Though I believe scotch kisses are caramel dipped marshmallows or free formed by hand, given the lumpy shape. These look a bit more like the caramel covered marshmallows made by Hammond's Candies, which I've never had the pleasure of tasting. Lovely! I had no idea that this could be done at home. Looks like a fun process! Oh my God. Talk about back with a bang! There's still time to ship some of these to me for Christmas. Shall I send you the number for Fed-Ex? dear Ms Humble. So glad to see you back. Who draws your illustrations. they are very fun. I do the illustrations. I'm no artist, but such crude/cute drawings on a laptop touch-pad always make me laugh. Glad you like them. Mr. H and I discussed which of my ideas I could attempt in easing my way back into blogging while pregnant. This one was deemed 'least likely for Ms. H to mess up'. I still managed to drop a chef knife onto my leg during the process! Pregnancy clumsiness is still in full effect. Mr. H took away my knife and replaced it with a pizza wheel. Such a worrywart. Me too! That plaid book of basics was my childhood candy making accomplice. haha Still have the scar to prove it! Oh my Gosh!!!! I love these candies!!! They are perfect!!! Yummy, delicious and a good treat for Christmas! Holy mother. These look divine. I want those! Oh my goodness. If only. He works in QMS and it is a job requirement that he annoy others. These are amazing! Two of my favorite things in one beautiful package. Well done! Yr blog is a real gold mine for me ! These caramels are perfect for a handmade Christmas gift! You are great! I'm glad you back : ) Sure it tastes delicious! These look amazing! Thank you for sharing. Now I'm really wanting something sweet! "True rebels wear butterscotch bandoliers" Ha Ha love it. The caramels are perfect. Welcome back. Wow I'm in love with this recipe!!! Looks so yummy! love the banter from all the comments! Oh my these are fabulous!!!!!! I must try to make this myself! what a wonderful idea. these definitely look like a must make! I am your newest follower. The first time I realized that I autonomy over my culinary decisions was a dangerous day, indeed. You have the patience of Job to yield such a beautiful candy. Sometimes working with caramel makes me want to pull my hair out--with the caramel attached to it. Yikes. You've been sorely missed! Your hiatus has left the world wondering when you would be tempting us with all your calorie-laden goodies again. I have never seen caramel-rolled marshmallows. These are amazing and so decadent. I think one could even choc coat them for good measure. AND I L-O-V-E, love, love the drawings. Is there anything you can't do, Ms. Humble?! You look adorably lethal with your hot sugar and candy weaponry. Indeed you are powered by sugar. "AND I L-O-V-E, love, love the drawings. Is there anything you can't do, Ms. Humble?!" These are so beautiful and so nice and neat! I am impressed! Wow - these are wonderful! Glad you're back...missed you. Love the little butterscotch bandolier! I made homemade scotch kisses earlier this year. This looks cleaner and nicer. I wonder if it would still taste as good if I made a pan of butterscotch and made it in the same method you used. Looks great! Om Nom Nom... Soooooooo good!!! And now to quickly deliver them to my friends before I eat them all! I just made these and they don't look as perfect as yours, but they look pretty good and taste amazing! One comment though - my caramel really stuck to the pan in parts (even though it was nonstick and I greased it) so next time I'll line with tinfoil. I managed to scrape off the stuck part and roll it out on a silpat until it was usable, so it was not a disaster in the end. The caramel tends to stick more from suction than stickiness in my experience (I dump it into an ordinary aluminum baking sheet with a little butter). When I release mine, I slide my hands under the caramel and wiggle my fingers gently until the whole sheet releases. Lining it might be a good idea, so you can turn out the caramel in one sheet, but I wouldn't use foil (even buttered) because if the caramel stuck to that you'll have a quite the headache separating the two. A silpat however, that would be a great option and perfectly safe to pour hot candy onto. Oy :( having a hard time with these! How did you get yours to stay so... square? And wrapped so neatly. Did you use glue on your wax paper? Seriously. I have 4 logs in the fridge and have cut only one into individual candies. Have wrapped 2 candies. BUT! They do taste PHENOMENAL. I have been looking for a recipe like this for TWO YEARS! Thank you!!! Can I use my granite countertop instead of a "marble pastry stone"? The waxed paper is taped down on the ends. Hard to see from the photos, but there is absolutely tape there. They won't stay closed otherwise. I used a freshly sharpened knife to cut the candies and that helped them maintain their shape. I should note that my knifes are absurdly-sharp. When I dropped the knife onto my leg while sitting at the counter cutting the candies it sliced into my jeans. Lost a pair of pants that day, but I am quite proud of that knife. Yup. Just butter up the granite and you're good to go. Ahhhh... the tape. I see. I ended up doing a sloppy twist job but it doesn't really matter because they taste awesome. And awesome is what we're looking for. My knives are pretty good too, for the cutting I used a buttered up kyocera ceramic santoku knife. Worked like a charm. But sorry about your jeans, always sad to lose a pair. That's why I mentioned the See's candy wrapping style for their scotch kisses (which is essentially what these candies are). Twist wrapping the caramels is a totally legitimate approach. I admit that were I not making these for the blog and the maximum visual oooh's and aww's, I'd just twist wrap them too. They might not hold their shape, but they certainly wouldn't taste any different. Also, I'm very pleased you enjoyed the candies. those look so good. I tend to avoid caramels, but I share your love of candy making in general. I learned at my mother's elbow. My particular love is old fashioned whipped fudge. And toffee. I've never cooked this recipe in a all-in-at-once style, it would be an interesting comparison to try both methods and sample the results. One of the reasons this recipe is set up like this is because it evolved from wet sugar caramelization that had the butter and cream added later (similar method as a dry caramel). Dry caramels are simpler to make in terms of crystallization and you can often judge by color rather than temperature, but I've never been a huge fan of the flavor, preferring the smoother caramel flavor that results when the hot sugar concentrates with cream. Well, save for perhaps ice cream, where I actually liked the bitter caramel notes combined with vanilla or chocolate. I could probably hypothesize about how in this recipe the added cream affects the Maillard reaction, or the liquid/fat of the added cream and butter adjusts the softness/texture but really, I just don't know for certain. The honest explanation is, I do it this way because after all my experimentations, tweaks, changes, adjustments and failures, this produced the exact caramel I wanted. I could play with simplifying the recipe... but If it isn't broke, why fix it? You do have me curious though. I may have to experiment to see what sort of results you may have gotten. Could be even better, right? That is interesting how the recipe evolved. I just made it the way I did because that's the way I make my candy. That's what works best with my fudge and toffee recipes. I had dumped everything in the pan before I remembered I was supposed to save some things back, lol! But as for the caramel, can you really ever have too much caramel? That's like saying you can have too much toffee. Hehe. Perhaps I should rephrase that. Should I have more caramel this week. Probably not... I've been very, very bad. Well, Ms. Humble, you're in the right position to say you are eating for two. I'd say go ahead and make Caramel V2.0. I'm sure Baby Humble would thank you very much for it. Welcome back! I don't know if its just my preggie-brain-fuzzy-thoughts current status, but that Eureka!-like illustration made me crack up. Saw this mentioned on Twitter and all I can say is OH MY. I wasn't going to add any more candies or cookies to my list, but I have to add this one. 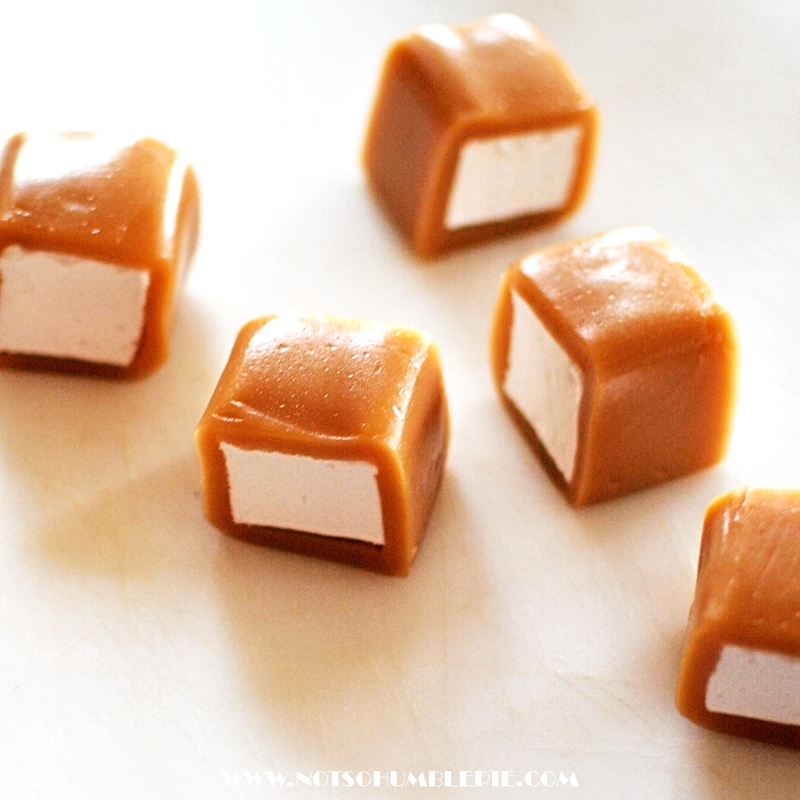 Caramel-covered marshmallows are my mom's absolute favorite candy, and she goes out and spends a ton of money on the gourmet ones, because you just can't find them anywhere! I can't wait to make a batch of these for her. I always try to post here but never have any luck. Your caramels are just wonderful looking. Very creative. What a great Christmas present!!! These are gorgeous!!!!!!!!!!! :) and my guess is that they taste fantastic!!! I had been contemplating on how to make caramallows (as they are called in the fudge shops in the Canadian Rockies). I figured it's only a matter of time before you put those two together. Excellent work! this is, hands down, my number one all time candy. we have see's candy here and they have what is called a "scotch kiss". this is a scotch kiss. these look perfect. i am going to attempt it! perfect post! Ohhh yum!!! I just discovered your blog! Thank you for sharing your yummy recipes! Thank you for this posting. I have wondered how they are made; and I know of a few poeple who are going to appreciate you as well, once I have these made. I really enjoy your blog. Thank You for such Beautiful Photos & Instructions! You are back my little cupcake! Anyway, the caramel eventually turned out fine, and the candies are delicious! It took nearly half a day to manage the assembly and wrapping, though... others should be warned that this is a time consuming project! Thanks for this recipe! My first time candy-making was a huge success, and quite a hit with the family. I made these and they were delicous! I even dipped a few in chocolate. They tasted just like the wonderful chocolate covered caramel marshmallows I used to buy at Casa De Fruita in California! caramel & marshmallow is my favorite combinations of flavors. These look absolutely devine. I don't think I would have the patience to make them. Looks time consuming. I hope your pregnancy is going well. It's difficult being pregnant while still looking after another little one. they taste DELICIOUS! buuutt I couldn't even wrap the marshmallows in the caramel decently so I ended up wrapping up caramel pieces and cutting the marshmallows. I didn't help that I started this recipe at 9 pm because i just HAD to. I even put all my snow gear at 8 pm just to go to the supermarket and buy missing ingredients! I ended up wrapping my little caramel babies by 2 am ..
My first attempt at carmel and marshmallows and it came out perfect! And delicious! Great instructions! But a bit of a fail with the caramel--my sheet ended up a bit too hard and kept cracking while I was covering the marshmallows. Could it be that my caramel got a bit too hot and was starting to reach hard candy stage? I was wondering if my candy-thermometer was reading a bit cool so maybe I overheated it? Thanks! Yes, hard caramel means the syrup got too hot. Correct. If your thermometer wasn't giving accurate readings this is either due to it being off, which is pretty common (one can double check it with a boiling water test reading) or not being submerged deep enough in the cooking syrup (some probes won't read the correct temp when submerged in an inch or less of syrup). I was wondering if I could use this, I'm guessing not, but hey, you never know. I have an even simpler substitution for you. You can use invert syrup (glucose/fructose) for the corn syrup in almost all of my candy recipes. I have a post here that outlines how to make invert syrup from ordinary sugar. Use it in the same amount as the corn syrup and it will do the trick. I made these today! So fun to make! I'm not a big candy eating fan myself (however the caramel was awesome! ), but made them for gifts and loved the challenge! I'm very happy with the finished product. i made these last Christmas and they were perfect. a huge hit with my grown sons and their wives since we are all from California and have no See's in our new Texas home. just made another batch for this season and they will be great, but the caramel didnt come out as rich and dark. i did reach 250, but wondering why its a lighter color. thank you for the great recipes! Interesting. Wild stab in the dark guess by me: How fast did you cook the batch this time? What gives the caramel their color is the reaction between the protein in the cream and butter and the heat. Just like browning a steak, just with dairy. We're actually not caramelizing the sugar at all, that happens at a much higher temp for glucose and sucrose and with caramels only happens with a dry process caramel (where you melt the sugar first then add cream). Rambling... Get to the point! Okay, so I bring my caramel up to temp slowly as a habit, just because i'm forgetful and I feel it gives the candy time to work its chemistry magic in the pot. Nice long hot bath for the protein, get the color and flavor right and If I run off to grab the baby nothing catches fire. I'm not sure if the caramel would be much paler if you rush the process, quickly evaporate the liquid and concentrate the syrup but perhaps it could. So that's my best guess at the moment.